Have you seen Willy Wonka and the Chocolate Factory? I’m talking about the classic Gene Wilder version from 1971, not the Johnny Depp version. 1 One of my favorite characters is Veruca Salt. I love the part when, upon entering the part of the factory where the golden geese are laying their golden eggs, she has a bratty tirade and then bursts into song about how she must have a golden goose…NOW! 2 I won’t spoil the ending for you if you haven’t seen it, but it does not end well for my beloved Veruca. I feel Veruca’s song mirrors the need for instant gratification that permeates our society. It’s pretty much status quo. Do you want to watch a movie? It’s available for instant download! Do you wants to know what’s going on in the world? Go on the internet! No need to wait until the next morning for the newspaper. Do you want to lose 10 pounds in two weeks? Try this diet!3 It seems to be everywhere. Intuitive eating is a practice of patience and resiliency. You will not start IE and, within a few weeks, become an intuitive eater. You’re gonna have to baby step this sucker! If you think about it, when did dieting enter your life? How many years or decades ago did it weasel its way in? It’s likely that dieting has been in your life in some way for a LONG time. If that’s the case, why would you expect to undo years or decades of approaching food and your body one way and then completely flip your mindset within a few weeks? For me, feeling bad about my body started around 2nd grade. I learned somewhere along the way that being thinner was “better”, so the idea that my body wasn’t ideal stuck with me. I began exercising a bit in middle school with the hopes of shedding a few pounds, but I didn’t actively diet until my mid-twenties when I heard a family member get compliments for losing weight. I thought to myself, “I have been exercising for years and I eat decently, so why am I not any thinner? !” I was drawn into the Weight Watchers concept of eating what you want while losing weight, and that is when dieting’s final seduction occurred. As I look back, I had been in the dieting mode in some form or another since I was about 7 years old. That meant that I had to overcome over two and a half decades of negative thoughts and feelings about food and my body. Though I was done with dieting and ready to dive into IE, it was was scary! It wasn’t like I was just breaking the habit of cracking my knuckles. The dieting world was a formidable opponent, and I knew that I needed to build some serious backbone in order to learn how to ignore the constant diet propaganda. Most people who I’ve communicated with on the IE community forum say that doing one or two IE principles at a time helps them. Some people claim that they did IE 100% right off the bat, but I noticed that they had only short-term success and were very susceptible to jumping back on the dieting bandwagon. It would be like quitting smoking cold turkey. I’m sure there are some people out there who can attest to just quitting, but most need some kind of support on their way to giving up cigarettes. IE is the same way. Taking it one principle at a time really allows the person to internalize the principle and make it their own. Once that happens, moving on to the next principle is an easier transition. Which principle should be the first one to tackle? I personally think that rejecting the diet mentality is a good place to start because I see it as the foundation of IE and it weaves throughout the other principles. If you are able to dump all of your dieting books and magazines, unbookmark your favorite fitness-for-weight-loss websites, and actually get angry at the dieting industry for being a puppeteer for so long, then tackling the other principles will likely be simple in comparison. However, you are a unique individual and you can choose whichever principle makes sense for you at this point in your life! Although I didn’t start with rejecting the diet mentality, I wish I had.4 I was a restrictor, meaning I dieted by consuming as few calories as possible, hunger pangs be damned! With the encouragement of my dietitian, I started eating when I was actually hungry rather than waiting until the scheduled time to eat.5 This took a long time. I fought with myself daily for a while because I felt like I shouldn’t be hungry because it wasn’t time to eat. At work, lunch is at 12:13pm,6 so I had to wait until then. This was a food rule that I had because dieting is all about following the rules. It had gotten it into my head with Weight Watchers that I had to eat as little as I could which meant I should be putting as much distance as possible between the times that I ate. Thus, I made up the food rule of waiting until the designated times to eat. As I reflect, this was guided by diet mentality. If had examined my place in the dieting world, I would have realized how entrenched I was and going after the diet mentality first would have made my IE journey a little easier. I finally got to the point where I could see how manipulated I was by the dieting industry, and that pissed me off! That anger fueled me when IE felt like the hardest thing in the world. It fueled me into reading something other than Shape magazine in the doctor’s office. Rejecting the diet mentality was one of the most challenging principles, but, once I conquered it, the other principles fell into place more easily. Intuitive eating is not a quick fix. It can seem impossible, like you’ve been told to climb up a mountain in a pair of flip flops. IE can be so overwhelming the first time you read the book. Or, at first glance it may sound easy, but, once you actually start, you may find that all of the parts put together create a sense of anxiety. One strategy that I have my counseling students implement is break apart big tasks into small chunks if they are feeling overwhelmed and anxious. This reduces their stress related to the pressure of a large task and they have bursts of success when each chunk is marked off of their to-do list. It’s win-win! IE is the same way. You may have a desire give up within a few days or you may want instant results and channel your inner Veruca Salt and scream, “I Want It Now”, but by breaking down IE into baby steps and focusing your mental energy on a principle or two at a time, you’ll likely be more successful. What is your approach to IE? “I want it now!” or slow and steady? Please share in the comment section below! 1Yeah, I saw Charlie and the Chocolate Factory version with Johnny Depp when it came out in 2005. It was “meh” compared to the original. 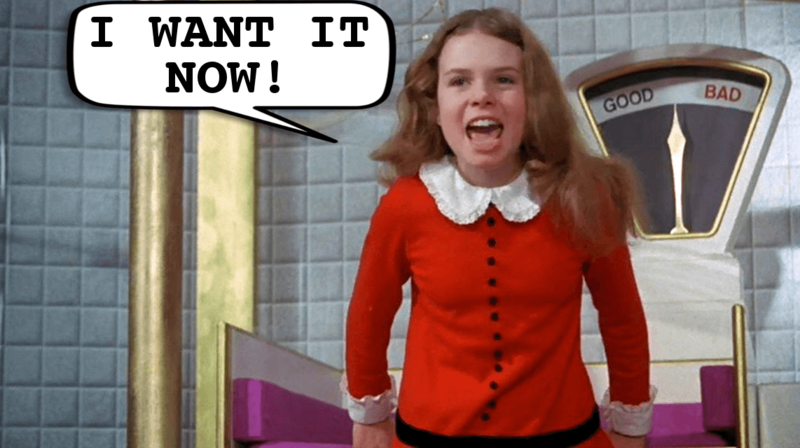 2Want to see Veruca Salt belt out “I Want It Now”? That’s why we have youtube! 3Nevermind that it took you more than 2 weeks to put on those 10 pounds! 4The expression “hindsight is 20/20” exists for a reason, right? 5I wrote about this in “Who Says I Can’t Eat Dinner at 4pm?” if you want to check it out! 6I worked in the public school system, so the class periods always seem to start and end at funky times. I too used to think of my INner rebel as a ‘demanding brat’ and one that I needed to tame/control/master. At some point it dawned on me that I was the one ‘rebelling’ to her! All those judgmental thoughts and actions were driven right from diet mentality which pushed me to ignore my own DEAR body. Of course my body wants what IT wants NOW, it has no sense of (EXternal) right or wrong. I got all that from diet mentality. And the main reason my INner rebel was in ‘bratty’ mode was because I had discounted and suppressed her needs for so long all that was left for her to do was scream louder and throw fits so I would notice. I now have a lot more understanding about how one can end up in a Veruca Salt mode. And while it seems like turning ‘her’ loose to tantrum out, I also have come to realize that either mode (bratty/freed wild) is not going to achieve what ‘both’ of us want. So I undertook to become the loving friend (ally) and embrace my INner rebel taking her needs seriously and helping her to ease them into satisfaction instead of trying to get them all at once. Yes the urge is to demand and expect making up for some much deprivation and suppression – all at once. However that really doesn’t happen and probably isn’t as effective as gifting myself a slower and more enjoyable experience which ends up lasting and rewarding longer too. Veruca is pure Id. I know the feeling.